My initial impression of the Sierra Designs Revival 65 backpack was that it's well made, with impressive design and attention to detail. Testing confirmed this assessment, though with a few points for improvement. At less than four pounds, the pack is quite light for its 65-liter capacity (a 50-liter Revival also is available). Though the torso length is not user-adjustable, it fit me perfectly. The hydration sleeve is narrow, but my largest criticism is the abrasion failures in the fabric on both hip belts due to a lack of fabric reinforcement along key edges. The big picture is that the Revival 65 is a very enjoyable pack to wear. It fits well, sitting on the hips firmly and hugging the shoulders and body snugly and comfortably. Even under heavier loads (up to 48 pounds) for an extended time the fit and even weight distribution prevent painful pressure spots. 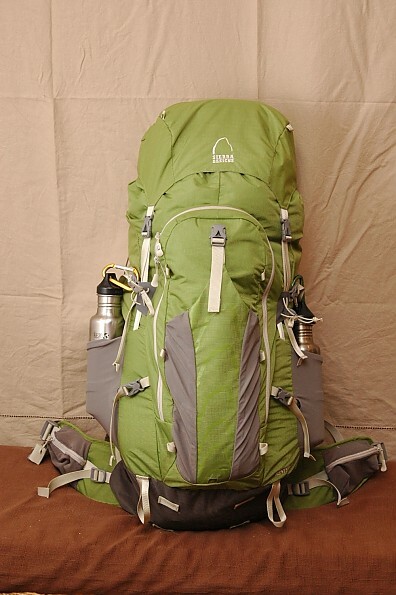 Best For: The Revival is best for three-season backpacking trips of intermediate length of three to eight days. I would definitely recommend this pack to a friend. The Revival has a fixed torso length and is not user-adjustable. However, it comes in two sizes: S/M (fits torsos 16-18.5") and M/L (fits torsos 18-20.5"). I specified my torso length of 17.5 inches and the S/M pack that arrived fit perfectly. Fitting the fully loaded pack by adjusting the various straps and hip belt was quick and easy. The pre-curved waist belt was perfectly angled to conform to my pelvic crest without creating pressure points. The shoulder straps arch gracefully around the torso sides and over the shoulders, distributing tension evenly. I was pleased with the pack’s capacity of 65 liters (3,800 cubic inches). The Revival holds close to the same amount of gear as my High Sierra Appalachian 75-liter pack. It would be a tight fit for long expeditions or most winter travel, but is ideal for most three-season trips. The adjustment straps and buckles are light yet sturdy. Strap attachment points are well placed and stitched. The main compartment cinch-closure is wonderful! Pulling on a little strap instead of pinching the cord lock releases it, making it effortless even with cold fingers. The exterior fabric (150D Nylon Rain Dobby) is quite water resistant, resisting heavy rain and numerous dunkings while canyoneering. Only complete immersion allowed significant amount of water into the pack. The pack does not come with a rain cover, which you might want for long periods of heavy rain. There are dual trekking pole/ice axe loops and elastic clasps. 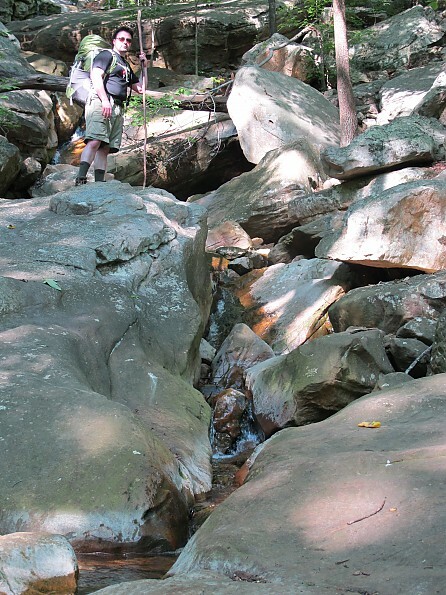 Gonzan crossing the crossing Hogskin Branch in the North Chickamauga Creek Wilderness, near Chattanooga, Tenn. 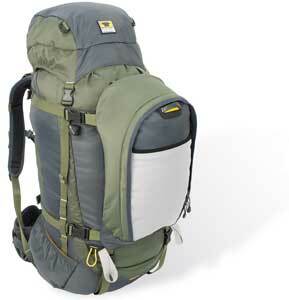 The pack has ample exterior gear loops: six in front, four on the lid top, and four on the underside. The loops on top and bottom could be slightly larger, as they are too small for a standard webbing buckle to pass through them. The front also includes a snow shovel/stuff pocket with a drain hole to expel rain and melting snow. The fabric panels and tailoring of the pack are well planned and applied. I appreciate this in little details like oval discs sewn at an angle into the fabric just above the hip belt to make room for free motion of my elbows. The Revival's suspension system is strong, providing excellent support while I carried an average load of 38 pounds and a maximum load of 48 pounds. The Fulcrum Suspension consists of five components: a single strong vertical DAC aluminum stay, a composite frame sheet behind the shoulder blades, a lower lumbar frame sheet, a pivoting fulcrum in the lumbar frame, and two flexible molded plastic hip belt supports. The hip belt supports pivot independently on the frame’s fulcrum point, allowing surprising lateral flexibility while maintaining a very secure load. That flexibility is wonderful for activities like canyoneering, climbing, and scrambling off trail. The pocket itself is large, divided by two mesh panels, and is convenient for easy stowage and retrieval of smaller items. The zipper pulls are slightly rubbery, ergonomically designed, very effective, and enjoyable to use. View inside the Sierra Designs pack. 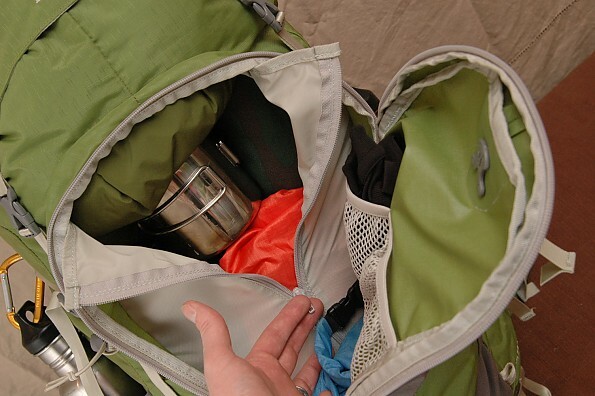 The pack has an internal hydration reservoir sleeve and corresponding openings and loops for a drinking tube. Unfortunately, the internal storage sleeve is so narrow that it is difficult to install a fully filled 3-liter reservoir CamelBak reservoir, though a 2-liter reservoir fits easily. Baffled military reservoirs, which are wider and lay flatter for easier packing, won’t fit. 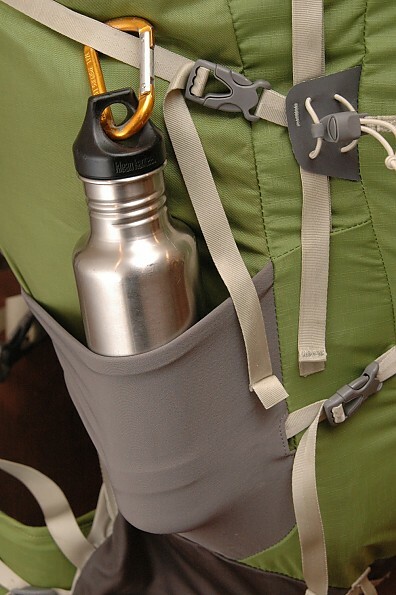 There are also two side bottle pockets of stretch material, which are nice, though they may lose elasticity over time. Compression straps pass through two sewn holes in each side pocket, holding bottles tight against the pack, a wonderful detail. Compression straps on side pocket. Two rear cinch straps and two buckles in front secure the lid. 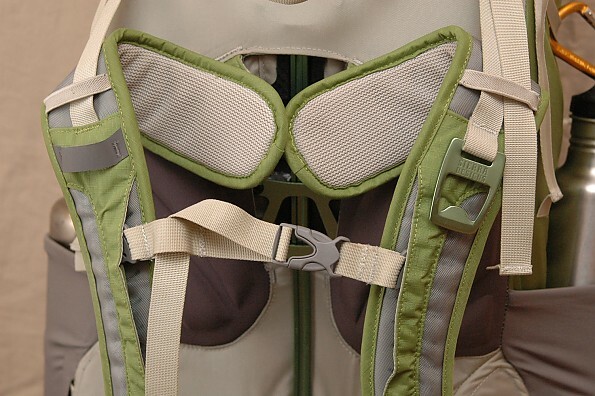 Both sets of straps are attached low enough on the body of the pack to allow the lid to be cinched down fairly well when carrying less bulky loads. It has one rear-facing zippered pocket with a rain flap to keep moisture out, and an internal zipper compartment dividing the main pocket. The lid is removable, but there is no fanny pack conversion feature built in. There are gear loops on the four top corners, so it could be attached to a webbing belt in a pinch. I tried to improvise a fanny pack this way — not very comfortable, but it works. The shoulder straps conform to the torso and shoulders smoothly. They are very breathable, with a vented die-cut foam core, fabric mesh on the underside, and plastic screen-mesh above. Both the lift stabilizer and tension straps adjust easily, cinch tightly, and permit very little strap creep. The built in bottle opener is an oddity, as I can’t imagine needing a beer bottle opener integrated into a backcountry backpack. Don’t get me wrong, I love a good brew, but if I’m gonna’ haul it out there, I’m not gonna’ need my pack to open it! This strap is superb. It uses a tube-style slider for vertical strap placement, and does not creep at all. Additionally, the adjustment sliders and tubes are covered by flaps of fabric, protecting your forearms from abrasion. The hip belt supports are pre-molded and conform to the waist. The integral pivoting feature allows the belt to stay ideally position, secure, and comfortable. 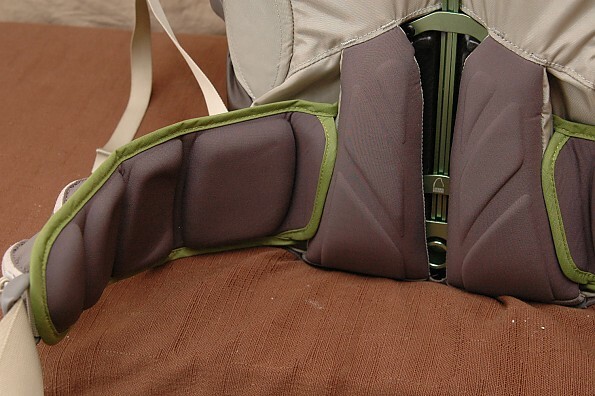 The hip belt padding is divided into three groups: a fixed lumbar group and one on each of the two movable belts wings. 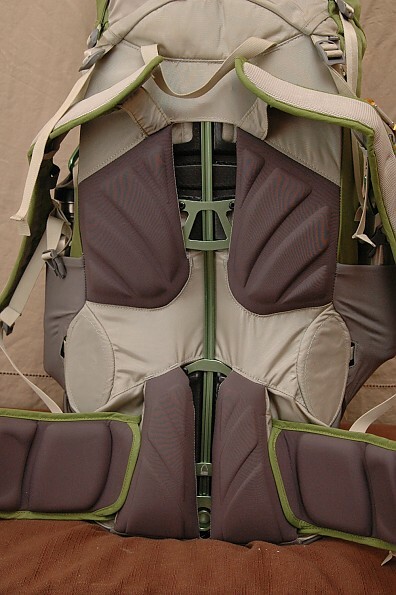 The padding initially looks inadequate as it is divided into ten smaller pads: four on each side of the belt and two vertical lumbar pads. I was surprised to find it is comfortable. It conforms to the hip better than one large, softer foam belt and provides greater airflow. On either side of the belt, there are stretchy zippered pockets, which are delightfully convenient. One of my favorite features of the pack is the forward-pull belt adjustment, which gives a good fit with little effort. Hip belt, showing segmented pads. The big picture is that the Revival 65 is a very enjoyable pack to wear. It fits well, sitting on the hips firmly and hugging the shoulders and body snugly and comfortably. The pack is rated to 55 pounds. Even under heavier loads of 48 pounds or an extended time the fit and even weight distribution prevent painful pressure spots. The ease of adjustment allows for effortless variation in carry. The Ventilation Conduits (gaps between each set of support cushions which allow air to circulate freely) provide relief from “sweaty back syndrome.” Feeling a cool breeze sneak under the pack is certainly welcome while climbing a steep rocky ridge in the afternoon heat! Overall, the Revival's construction and materials are good: Stitching is tight, fabrics are light yet tough (150D Nylon Rain Dobby with some 315D Cordura for reinforcement), zippers are smooth and sturdy, buckles seem to be strong, and craftsmanship is notable. Where the shoulder straps attach to the pack could be reinforced, as the fabric or stitching might tear if one took a tumble. My largest criticism of the pack is the abrasion failures in the fabric on both hip belts due to a lack of fabric reinforcement along key edges. The edges of the molded plastic hip belt supports are hard and sharp. The fabric sleeves of the belt slide over these hard supports. This fabric is a single layer, no thicker than the rest of the pack. While a heavy fabric tape is sewn to the very tip of the supports, the majority of the edges are not taped or reinforced at all. 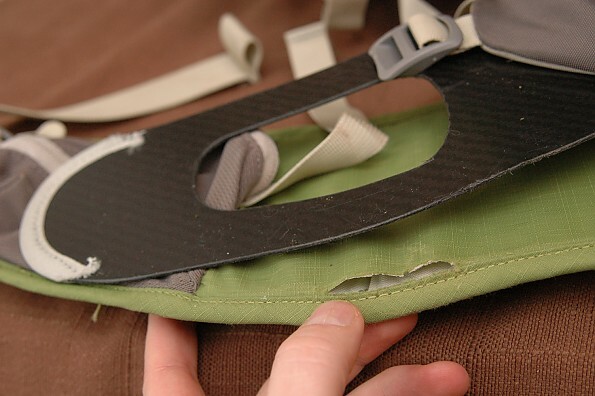 This thin fabric is unprotected from those edges, which rub against objects frequently. 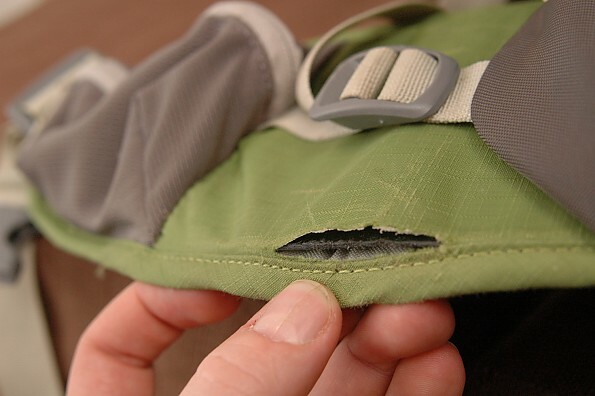 Even if you wear the pack only for smooth trail hiking, those edges will abrade every time the pack is taken off and set down. If you are as active and adventurous as me, the edges wear through quickly. Sierra Designs' Revival video promotes the pack's use in challenging environments, so there is a reasonable expectation for it to hold up well under technical use. I am quite pleased with this pack, and would definitely recommend it to a friend, though I hope Sierra Designs resolves the abrasion problem with the hip belt. I plan to use the Sierra Designs Revival 65 for the next couple years as my main three-season pack and for any canyoneering and climbing. I used the Revival 65 pack on 12 separate outings over 23 days and eight nights, covering 51 miles of trail and 10 miles canyoneering. All of the outings were in Southeastern Appalachian mixed terrain. One trip was along the highland border of Tennessee and North Caroline, while most were in and along the Cumberland Plateau escarpment and canyons. I hiked over steep terrain, frequently changing elevation between a few hundred feet to more than 2,500 feet. 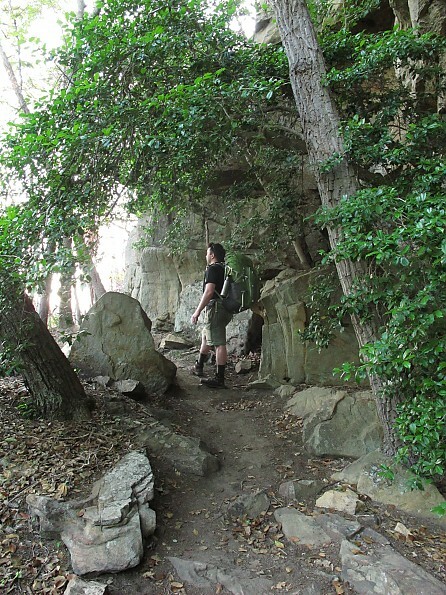 The trails had much sandstone and limestone rock, and many creek crossings. Two outings were challenging canyoneering day trips consisting of mixed creek scrambling, bouldering, and vertical rope work. Gonzan testing the Revival 65 pack along the Cumberland Plateau on the Stevenson Branch Trail near Chattanooga, Tenn. I purchased this pack and it is amazing. I was concerned about the hydration sleeve also. So I bought the platypus big zip 3L and it fits perfectly. The two hooks in the pack for the hydration bladder hook onto the bladder perfectly almost like it was meant for the platypus. I love this pack and can't wait for the years to come. Awesome pack. 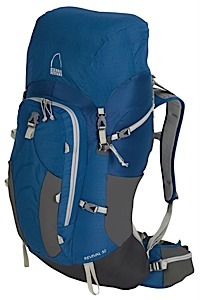 Excellent balance between lightweight pack and ability to carry a heavy load comfortably. Fulcrum single stay suspension moves with your body. Great organization. Top load with front access. I did a ton of research trying to find the right pack. Weight was a major concern coming form a heavy pack. 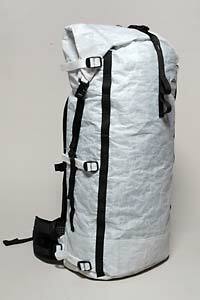 The problem is most light packs also have thin straps and a low max weight capacity. 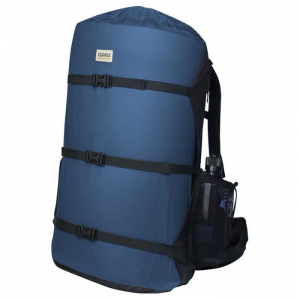 This pack is light; but, can also carry a substantial load if needed comfortably. 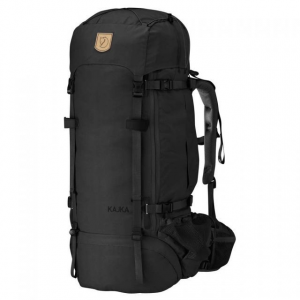 The pack has wide comfy straps with good foam and an amazing suspension system. The Fulcrum suspension really moves with your body and is non constricting when turning or pivoting. I narrowed my choice eventually down to two packs — this pack and an Osprey pack. While communicating with manufactures and customer support to get answers to questions I had with both packs, I was offered an opportunity to test this pack. No, I did not pay for it; however, it was one of only two choices narrowed down from a multitude of options. This pack is amazing. I since have 4 friends who have purchased this same pack after seeing it in action and comparing it to other choices out there. As far as it compared to the Osprey pack I was considering... In the end, this suspension and airflow is a (in my opinion) better solution that Osprey's. The air channels work great while keeping the load closer to the body. The Ospreys mesh panel does a good job of venting; but, pushes weight father away from the back. The Revival's Fulcrum suspension moves better with the body. Yes, I have since also had the opportunity to try out the Osprey pack. 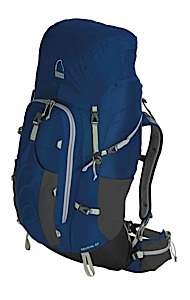 This pack is top loading with front access to get at items mid trek. You sacrifice a separate sleeping bag compartment which I don't use and feel is not needed anyways. I would much rather have top load with additional panel access than a sleeping bag compartment. The organization is fantastic with plenty of pockets for a light weight pack. The hip pockets can actually hold a cliff bar or small camera etc. The pack is fairly water resistant. After getting caught in a heavy down pour last summer, the internal portions stayed dry. So far I can honestly say the only feature I wish this pack had would be a system for stowing trekking poles on the fly. I tested my pack. My friends all payed for theirs because they saw how great it is. This pack is "The Pack". I could not find a better balance of weight to comfort in any other pack. The author of this review was an employee of Sierra Designs. 1) No fanny pack in the top lid to save weight. 2) The bottle opener was our attempt to have some fun, yes it probably won't be used as an opener by most hikers but it will serve as an attachment point for GPS, Spot Radio, etc. 3) No separate sleeping bag compartment, again, to save weight and reduce places for water to seep in. 4) CamelBak has made their reservoirs wider, we'll have to increase the width of the reservoir sleeve to match. 5) Good to know that the hip belt needs reinforcement around the entire frame sheet. That problem didn't come up in our testing but I won't argue with it and our warranty and repair center can replace a belt as needed. I am curious to know if you guys have made any improvements to the bladder sleeve and the issue with the hip belt friction ripping? I used the SD Revival 65 for a week in Moab and love it. Very roomy and easy access to all areas of the pack. I used the SD Revival 65 for a week in Moab and love it. Very roomy and easy access to all areas of the pack. Steep up and down for 16 miles round trip and it was never a nuisance. I could pack for a week trip with this pack. I even used it for a short 6 mile round trip hike and it was still lighter and more comfortable than my smaller backpacks. Green color is pleasant. No problems with zippers or straps. No discomfort other than a little toasty around front chest straps when temps were greater than 60 degrees. Hip belt is stiff but not uncomfortable. Hydration pocket works fine for my 100oz. H20 bladder. 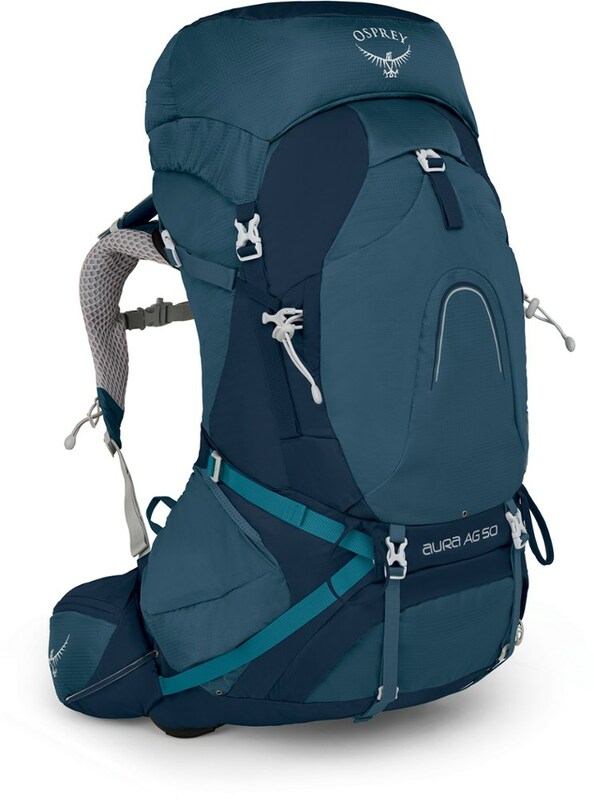 I would recommend this pack to anyone looking for high quality construction, lightweight, roomy, fairly inexpensive backpack. The Revival 65 is big though, the 50 would probably work just as well for weekend trips. Not sure I trust the 2 big side pockets to hold things in. I use carabiners on anything I put in there. After a summer of use... not one complaint. Great bag!!! The Sierra Designs Revival 65 is not available from the stores we monitor. It was last seen April 12, 2017	at Rocky Mountain Trail.